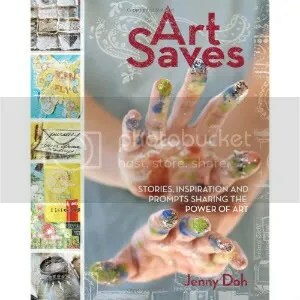 I just finished reading Art Saves: Stories, Inspiration, and Prompts Sharing the Power of Art by Jenny Doh, and it is everything the title promises. Part self-help, part how-to, the book features short biographies of twenty artists who find strength, healing, and self-expression in creating art. The artists share their guiding principles and inspirations, examples of their work, and directions/prompts for artwork modeled after their own. I found the range and variety of artists compelling, and their words carried with them a sense of community and hope that made me want to head for my studio. In the last four years, art has played an increasingly important part in my own life, especially when it comes to processing the emotional and spiritual challenges that accompany serious, life-changing illness. Although Art Saves largely features professional artists, I certainly don’t think you need create art for a living to appreciate the sentiments these artists share. The projects are accessible, and the stories honor our creative diversity while still being sweet reminders of all we share. I am planning several projects inspired by my favorite artists in the book and will share them in the coming weeks, but I encourage you to check it out on your own.